Do you need a sturdy yet lightweight AR-15 buttstock assembly that’s quick to install and looks cool besides? Then Skullaton AR Fixed Stock MBA-2 by LUTH-AR is definitely for you. This A2 style fixed stock offers an ergonomic design along with a distinctively 21st-century appearance. The MBA-2 is interchangeable with A1 and A2 buttstocks and all other aftermarket buttstocks that are 10 ½ inches in length. 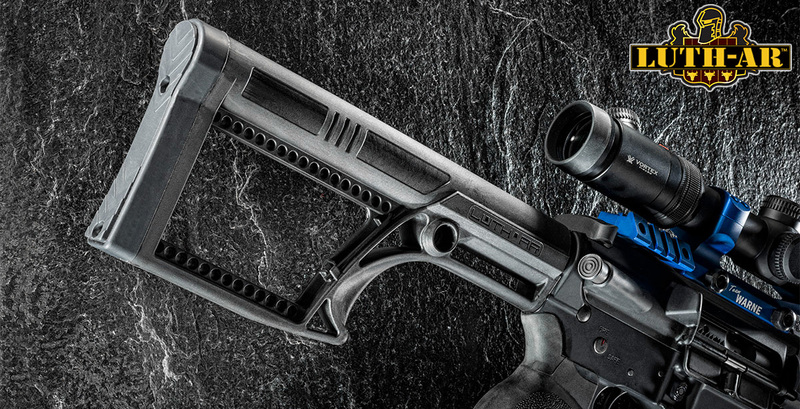 If light weight is a requirement for you, this stock is your answer. Weighing in at a mere 0.7 pounds, this LUTH-AR stock meets all the requirements for the class of featherweight stocks. The MBA2 is fully customizable with other LUTH-AR accessories including a cheekplate and a buttplate. No situation is too extreme for the Skullaton to withstand. People of all backgrounds – law enforcement, military personnel, competitive shooters, homeowners – can benefit from the sturdy construction of this stock. Made from glass-filled nylon, the MBA 2 can handle calm weekend trips to the range and demanding combat operations with equal ease. The Skullaton MBA-2 fixed stock assembly compete kit includes an A2 extension tube (buffer tube), a buffer and a recoil spring in one convenient package. The simple installation process allows you to begin using your new stock assembly the day you receive it. Would have been 5 stars but the skullaton model does not have qd sockets installed just the holes to install your own.